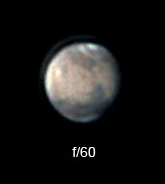 Mars is now getting close enough that those of us with smaller aperture scopes can capture interesting images. Therefore, this seems like a good time to start a small-bore Mars challenge to run alongside those we already have for Jupiter, Saturn and the Moon. So please share your images of Mars captured with apertures of 6" or less here! For those of us in the temperate parts of northern hemisphere, Mars is particularly challenging given its low elevation. Mars currently transits at about 21° above the horizon where I live, and it will remain close to that around opposition. Nevertheless, on good nights I can now make out surface features at the eyepiece, and capture even more detail when imaging. Here is my most recent Mars image from this morning (April 16 2016), captured with my new ASI224MC camera and a Nexstar 6SE with 2x Barlow. For this I captured 3 avis of 30 000 frames (average 157 fps) and combined the resulting stacked images from AS!2 in WinJUPOS after sharpening in Registax. A little additional processing was done in Photoshop (sharpening/blurring, colour balance). Nice to see clear views of Syrtis Major and the cloud in Hellas Basin. I'm still getting the hang of processing captures from this camera, so I'd welcome any tips that might improve my Mars images. I look forward to seeing what other small-scope users are capturing! Edited by KiwiRay, 16 April 2016 - 12:45 PM. Here's an image from this morning. A ridge of high pressure has brought Seattle a couple of days of good seeing (and record April temperatures up to 31°C). And I'm happy to keep challenging myself in this topic! Probably not many people with small scopes are crazy enough to get up at 3am to image Mars. Man, you're really beating Mars up amigo, two great images so far. This thread is eating me alive because I can't see Mars from the observatory!!! It's too low and behind a stand of trees...same as Saturn. The worst part is that Jupiter will be the same after this apparition Guess I'll be doing lots of lunar and DSO work in the foreseeable future. I am considering putting in an outdoor pier by our deck, but it will still have me looking over my neighbors roofs; probably better than the alternative though. I'm so glad you started this thread for Mars. Thanks. Thanks, Brian. I'm pretty lucky, as Mars only just clears the neighbours' trees for about 45 minutes before transit from my backyard. So I have a pretty narrow imaging window, with no waiting around for seeing to improve - I have to take what I get - but at least I can have a go without leaving home (or undertaking construction projects!). I might not be so lucky in 2018. Edited by KiwiRay, 19 April 2016 - 11:00 PM. Better conditions this morning gave me my best Mars yet. Really happy to get a clear view of cloud around Elysium Mons. This was my first use of a 3x Barlow (had used 2x before), which seemed to allow me to get a larger-scale image without sacrificing clarity (although the seeing helped too). Edited by KiwiRay, 20 April 2016 - 08:11 AM. This was taken early Sunday morning (4/17) in excellent seeing. Shot with my Quickcam 4000 Pro through 130mm f/5 Newtonian and 5X barlow. Processed through PIPP (best 1200 frames), stacked in AS2! (25% of remaining frames, 300 total), wavelets and color balance in Registax 6, tweaked with Photoshop CS2. Camera limits me to 10fps, so I will take a LOT more frames the next time out. Hopefully conditions will be similar near opposition, and I can get even more surface detail. That is a lovely image, Goldspider - very smoothly processed. You also captured the cloud around Elysium Mons, I think. That's what I concluded too! Thanks for the feedback, I was thrilled with how it turned out. And thanks to others' feedback on color balance; I tweaked that a bit too. Edited by GoldSpider, 20 April 2016 - 11:10 AM. Really nice images of Mars. I had a view on the 18th much like yours on the 20th and made this sketch. Syrtis Major has rotated a little more into view in your image. A really nice sketch, Ed - you can see details at the eyepiece I will never see with my small scope. Right now I can make out the shape of large dark features (particularly Syrtis Major) and the brightness of Hellas Basin. Still, I'm happy to be able to do that after months of looking at a tiny orange disk. I'm impressed what your C6 can deliver. A great post, and an inspiration for others with this aperture. Well done! And a great image of Mars! Thanks, Glen! I'm very pleasantly surprised at what can be achieved with a smaller scope like this. I also have an ADC on order, so I'm interested if further improvements are possible using that tool. Hopefully it arrives before opposition! I'm amazed you guys can get this kind of resolution with a mere 6". Nice work! I never would've guessed 10 frames a second with such a smooth image! Very well done. Mars is still past my bedtime but next month I'll start imaging. Mars, Nexstar 6SE, Alt/Az, ZWO ASI224MC, 2X Barlow, post processing in Autostakkert!2 and Registax 6. Very nice, Stargazer! Your image has south up, and is mirror reversed, so it took me a few moments to figure it out, but I think you captured the same view as Goldspider up above, with Elysium Mons near the centre. Edited by KiwiRay, 21 April 2016 - 10:24 PM. 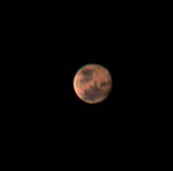 Mars, May 4th (UT) shot with a Questar Standard and ASI224MC. Already shown in Questar forum. Figured since we had the official challenge thread I'd dig this one out, I think I posted it back when I imaged it in 2012 but it won't take up much space here. This is from the Mars apparition of 2011-2012, taken around the end of March/beginning of April 2012 on one of those rare nights of excellent seeing. I was using my DBK618 on my C6/CG5 system and for this particular image had a 2x barlow stacked in a 3x barlow - I originally labelled it as f/60 but after doing some reading it may be more correct to call it f/50; either way the conditions were perfect and I probably won't see them like that for a good long time. I just wish I could find the original video file as I'd love to give it a fresh try using all of the techniques I've learned over the past four years. This one came out OK but looking at it I can see some things I would have handled differently when processing it. Great colour and detail for such a small scope, Nicolas! It looks like you've captured some thin cloud east of Syrtis Major, something I haven't been able to do well yet. I looked it up, and Mars was only about 12.6" at the time of your image - this is a great image for such a distant Mars! Conditions might be far more challenging this year, but on that rare perfect day, the much larger apparent size of Mars should give us a good chance of capturing a nice image. Thank you. Yes, I do the same interpretation. It seems to be blueish high altitude haze. It is likely, I saw recent Mars pictures on CN made with much larger scope and the numerous clouds were obvious.